Android Newsgroup Downloader. Automatic downloader for binary usenet newsgroups. This software is compatible with Windows version 95, 98, ME, NT, 2000, XP, Vista, Windows 7, and Windows 8. Copyright (c) 2013 SB-Software. All Rights rreserved. 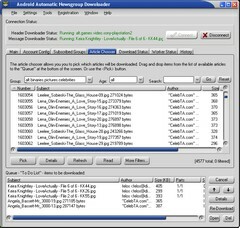 Android is a new newsgroup downloader that is designed especially for downloading from today's huge binary newsgroups. Android handles all types of binary newsgroups -- picture, movie, music, application/rar, and more! Android now supports encrypted usenet services. "Registering" is the term we use for how you "buy" the software. Please register your software today. The price is cheap, your registration is good for all future versions, it helps me to continue to develop the software, and you get other SB-Software programs, such as QuadSucker and Sortpics included with your registration for free!! Would you like to know more about Android, and how it can accelerate your downloading experience? View some screen shots of the program in use. Read the online documentation / users's manual. Check out the FAQ and HOWTO section for more tips! What make Android special ? Android is designed for handling huge newsgroups. Newsgroups with hundreds of thousands, or even millions of posts are absolutely no problem with Android. Android has a queue-oriented design. You drag and drop the posts you want from the list of available posts to Android's queue, where they are downloaded. Android remembers its queue from one session to the next, and remembers what you have already downloaded. Android saves the newsgroup headers from one session to the next. This means you don't have to spend half an hour re-downloading 2 million headers from that huge alt.binaries group. Android is multithreaded. Android accelerates downloading of large multi-part messages by downloading the parts in parallel. What can you download with Android ? movies: avi, mpeg, mpg, and more! Android can download any kind of content from a newsgroup. The files are automatically downloaded and decoded (uudecode, mime, yEnc, Base64 are all supported). What about 'posting' to newsgroups ? Yes, Android can also post to newsgroups. Right now, Android is limited to posting single-messages, such as simple text messages, or messages containing small files, such as images. I'm working on adding a full-fledged multipart poster (forbig files like mp3, mpeg, etc) to Android as well, which should be done soon. Click here for a quick demo of how to post news messages with Android. This section hilights some of the more significant changes (see the users's manual for a complete revision history). Bandwidth Counters (5.0) keep a running total of the bandwidth that you have used from your ISP. Queue oriented design. Download what you want, and skip what you don't. Support for huge newsgroups with hundreds of thousands or millions or posts. Multithreaded download accelerator downloaders multipart news messages in parallel. Supports yEnc, as well as uudecode, mime, base64, etc. Saves queue from one session to the next, so you can continue where you left off. Headers are cached on disk to prevent time-consuming header reloading. Allows importing of NZB files.